On May 8, the same day that Baldetti was forced to resign as vice president, the CICIG released phone recordings of wiretapped conversations between a ringleader of La Linea, Javier Ortiz, and businessman Luis Mendizábal. The conversation describes how Ortiz’s lawyers had bribed Judge Marta Josefina Sierra de Stalling to obtain reduced bail and a favorable house arrest sentence in exchange for a financial kickback. “I just spoke with Chepito,” Mendizábal says in a recording, referring to the alias of a lawyer involved in the transaction. “He told me not to worry, that he has everything set up for our defense, but that we can’t get more lawyers involved.” The conversation also details the existence of a clandestine operation in which lawyers connect clients with corrupt judges to escape convictions. The “Law Firm of Impunity,” represents just one of the ways the Guatemalan judicial system lacks the autonomy necessary to function as an independent and impartial institution. In fact, for much of its history, Guatemala has suffered from extremely high levels of impunity; corruption and lack of independence have been the norm rather than the exception, as well as a pattern of threats and retaliation against honest judges who bravely attempt to take on sensitive cases. Politicization of the courts at the highest levels has also resulted in rulings that go against the public interest, and in some cases, run contradictory to Guatemala’s own laws. The Constitutional Court demonstrated this tendency when it overturned the verdict in the genocide case in 2013 and a year later ruled erroneously that the Attorney General (who pushed the case) should leave seven months before the end of her term. Similarly, elections of Supreme Court and appellate court judges in 2014 were heavily criticized by national and international organizations for its lack of transparency and for the influence of special interests. The issue of judicial independence was discussed at Inter-American Commission on Human Rights (IACHR) hearings in both October 2014 and March 2015. In March, former court of appeals Judge Claudia Escobar testified about how she was forced to resign from her position after being pressured by a member of Congress to make a decision in his party’s favor. Many other judges report similar pressure or threats when their cases have involved people linked to organized criminal structures or political parties. The State has also systematically marginalized the judges and public officials who have taken a stand against impunity. Judge Yassmín Barrios, for example, faced public defamation after overseeing the genocide trial and its verdict that found former general José Efraín Ríos Montt guilty for genocide and war crimes. She also faced retaliation from Guatemala’s Bar Association, which tried to suspend her from the Bar for a year. Dr. Cesar Barrientos, who served as President of the Criminal Chamber of the Supreme Court, took his own life on March 2, 2014 after he was subject to various forms of threats and slander for his work and advocacy to support transitional justice efforts. The prosecution of the “Law firm of Impunity,” therefore, is not shocking in its revelations of judicial foul-play, but in the willingness of prosecutors and judges to take a stand against impunity and to prosecute those who thought they were untouchable. Authorities have arrested nine individuals, including Ortiz, and two others leaders of La Linea, Miguel Ángel Lemus Aldana and Salvador Estuardo González Álvarez, as well as the lawyers who cooperated in the bribery scheme. 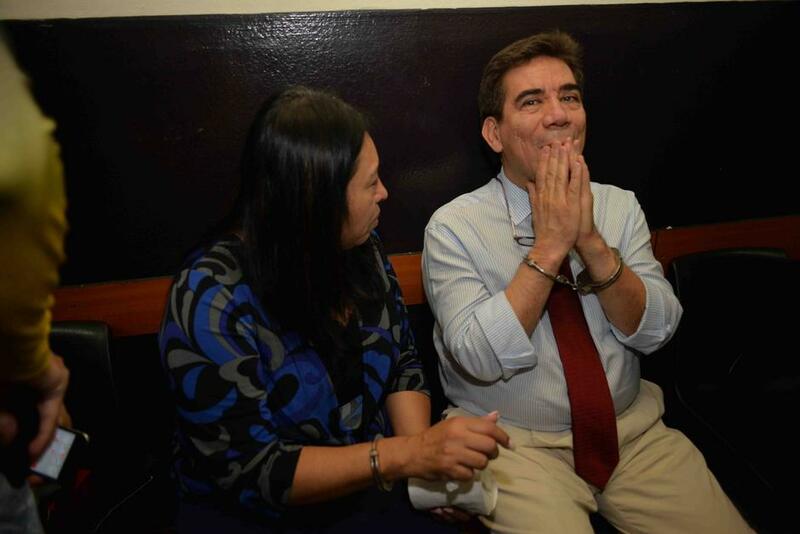 González Álvarez was originally released in May due to “lack of probable cause,” but was re-arrested on June 9 on appeal by the CICIG and the Public Prosecutor’s Office. Most recently, on June 26, a fourth attorney, Roberto Stalling Sierra, was arrested. Interpol has authorized a red alert status for both Mendizábal and Baldetti’s former private secretary, currently fugitives. The Special Prosecutor’s Bureau and the CICIG filed a request for impeachment of Judge Stalling to the Supreme Court in May, but the court has yet to make a decision in the case. Serious discussions are taking place this week around much-needed judicial reforms. With continued support from the CICIG, civil society groups, and leaders from within the judiciary, there is huge potential for positive change throughout Guatemala’s criminal justice system. The next step will require sustained political will from other sectors, including Congress and the Executive. It won’t be easy, but for the first time in a very long while, there is hope that lasting judicial reforms will take place. This entry was posted in Human Rights Analysis, Impunity and tagged Bufete de Impunidad, impunity, judicial reform, La Linea, Law Firm of Impunity by ghrcusa. Bookmark the permalink.